CHUYÊN PHÂN PHỐI LẺ GIÁ SĨ KVM EXTENDER CE610 USB 2. 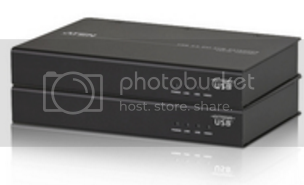 The CE610 USB 2.0 DVI KVM Extender is a DVI and USB Extender that supports. ExtremeUSB® and HDBaseT technology. The CE610 USB 2.0 DVI KVM Extender can extend DVI and USB 2.0 signals up to 300 ft (100 m) from the source using a single Cat 5e/6 cable. * Note: The CE610 supports a maximum combined USB transfer rate of 30 Mbps for attached USB devices.